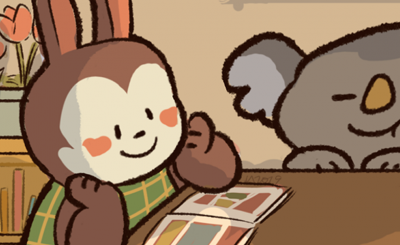 The February Nintendo Direct was preceded by all of the cozy witches online meticulously aligning their Tom Nook amiibos and New Leaf game cases, same as every other Direct since the Switch hit the market. So, let’s go ahead and get the biggest disappointment out of the way. No, Nintendo had nothing to say about a new Animal Crossing game for the Switch. Or any system, for that matter. But it’s hard to feel completely snubbed given the trove of new announcements, updates and sneak peeks they provided during the 36 minute video. The sequel to the inventive Wii U and 3DS title once again puts an expansive collection of tools and options in the hands of players to allow them to construct their very own Mario levels. Just like the last game, the content and assets available span the entire history of the Mario franchise, including Super Mario 3D World. 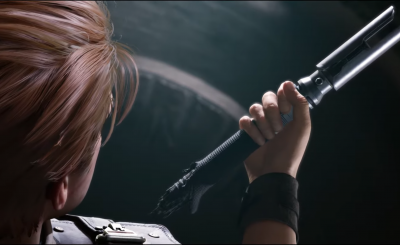 The game is probably best known for the stupendously difficult levels shared on YouTube and other social media, and we can expect another rash of those challenges with the sequel. There was nothing in the trailer to indicate Super Mario Odyssey would be among the available swatches, but with time left until it releases in June of this year, we may yet see a surprise appearance. While not technically a new announcement, the Direct fleshed out a lot of what to expect from this game, including a full title. Thanos and the titular Black Order stand in the way of the protagonist and a “huge cast of superheroes”, which isn’t surprising given the latest Marvel films. Up to four players can join in local or online multiplayer, and Captain Marvel will make her video game debut in her official new movie look. You can join the caped crusade summer of this year. 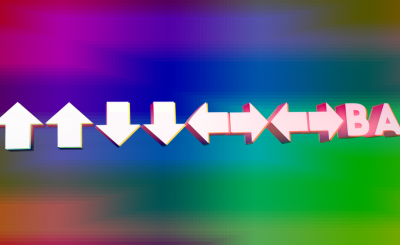 If you missed this deceptively simple looking puzzler on the 3DS back in 2015, you aren’t alone. Luckily, Nintendo is continuing the trend of rereleasing every game during the WiiU’s lifetime on the Switch (including games not actually ON the WiiU.) 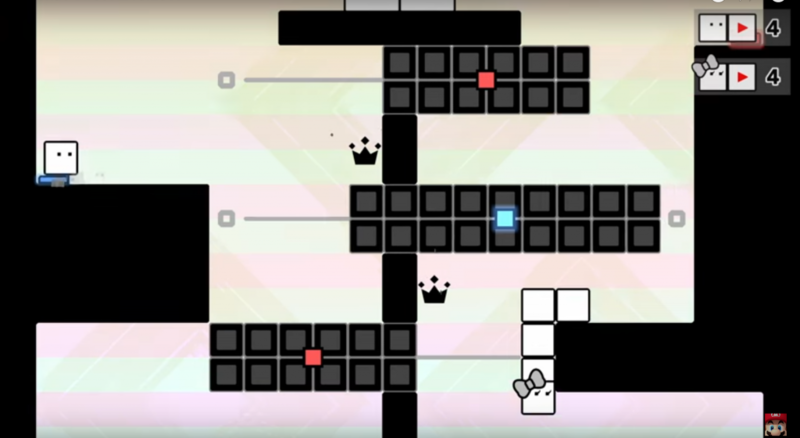 BOXGIRL allows for 2-player cooperative solving, and the game boasts 270 total stages to solve. Also new to this title is a series of puzzles starring Qudy, “the tall one.” I absolutely love Qudy. This Castlevania-style game puts you in the shoes of a cursed woman who must use her abilities to tackle a demon prince fortified in his castle home to save humanity from a dark fate. Yeah, so it’s not the most innovative story. But where Bloodstained show off is in new mechanics. The protagonist can steal enemies abilities to wield against them, affect gravity at her whim, and zip around the screen lighting-quick. Also of note is the ability to customize the player character’s hair, face, clothing and more, which is exciting given the relative dullness of the conventional Castlevania protagonist. Mario’s longtime ally and steed (???) has lately been off having too-cute adventures in what looks like a kindergarten crafting corner, and Crafted World continues with a cardboard-and-crayon aesthetic that belies pretty interesting level design. 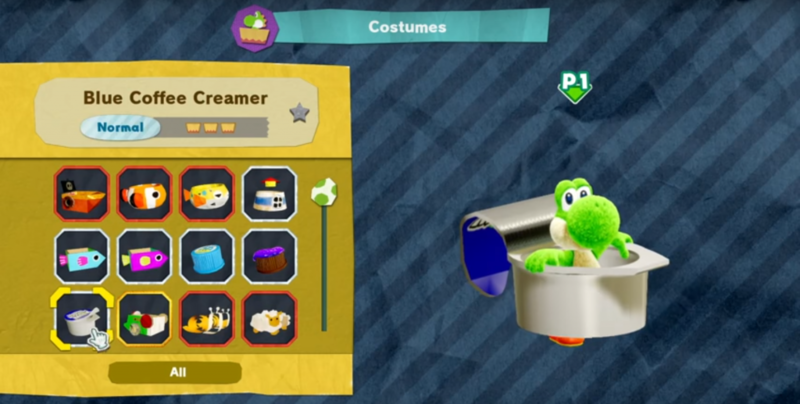 One new detail shown in the Direct was collectible costumes that not only provide Yoshi with a little extra protection; but dress him up in juice cartons, little papercraft boats, or even a Labo peripheral. You can try the game for yourself by downloading a demo in the game store now. The full release is scheduled for March 29. PlatinumGames, the studio behind the Bayonetta series, announced a new game called Astral Chain. A pair of police officers in a near-future city command mechs in their duty to protect the city against a shadowy force. Actual details are thin, but the game showed off a showy and acrobatic combat style that should delight fans of the studio’s past work. The game is scheduled to release August 30 of this year. Oh, and they quickly tacked on a statement saying PlatinumGames is also concurrently working on Bayonetta 3, but said nothing more. Nintendo closed the 36-minute Direct by announcing a complete remake of 1993’s Legend of Zelda: Link’s Awakening. The original Game Boy title was the first portable one in the series and found Link shipwrecked and washed up on the shore of Koholint Island. You know, the one with the giant egg resting at the top of a volcano? The game boasts a completely redesigned look in 3D, but we also saw a section where you controlled Link in a 2D, sidescrolling environment. We know the game will drop on the Switch sometime this year but will have to wait for anything more. Nintendo decided to play coy with any new information regarding the latest entry in the Brawl series. Version 3.0 will supposedly bring big changes and additions to the game, but that’s all they were willing to say during this Direct. They were gracious enough to confirm Joker and the rest of Challenge Pack 1 will drop before the end of April, so we will at least see that comin’. The adorable adventure of the Mushroom Kingdom’s most intrepid explorer gets a fresh round of updates and additions that go live today! Anyone who currently owns the game can download an update that provides 2-player support for every map. Additionally, a paid DLC adds five new courses and 18 new challenges for you and that friend to tackle. If you’ve yet to pick up this wonderful title, a new bundle is also available in the game store today that includes everything. 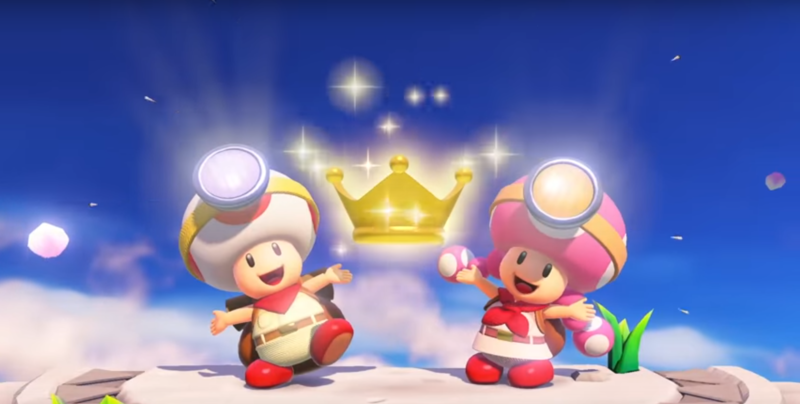 Time to start exploring with Toad! Japanese players are already enjoying this meet of Minecraft and Dragon Quest, but the rest of the world will get their chance on July 12. 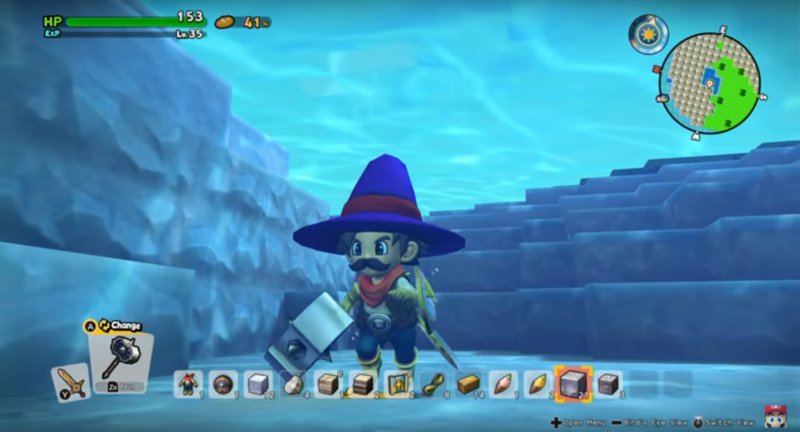 The design of the characters and world has been slightly updated to reflect Dragon Quest 11, and new methods of traveling and navigation have been added, like gliding, dashing and warping across the map. If you are initially turned off by the concept, I urge you to give it a chance. It’s essentially a retelling of earlier Dragon Quest games integrated with interactive crafting and town defense systems. The latest addition to the long-acclaimed JRPG series finally hits the Switch in fall of this year. New and returning players can enjoy new fully orchestrated soundtracks, in both Japanese and English, a 16-bit mode that hearkens to the series’ earlier days on Nintendo systems, and new character-specific stories and quests that will provide new information and lore. The direct invested a lot of time divesting details about the next upcoming entry for the Fire Emblem series: Three Houses. The name points to a decision players will make early on regarding who they will support as the attend a transnational combat academy. Each political power will be represented by a peer in your school, and your loyalty will likely affect the story in major ways. Three Houses looks to lean hard into anime aesthetics in both look and storytelling. In fact, all of the House leaders are just too damn attractive and will likely cause trouble for players and themselves. As rumored, Nintendo officially stated that development on the game has forced a delayed release, which is now slated for July 26.